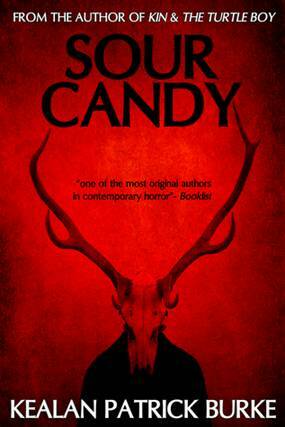 I don't want to say the novella is the future of horror fiction, but Kealan Patrick Burke makes it difficult not to say it after the whirlwind ride that is Sour Candy. It's a neat, little bundle of bizarre with not one wasted word and as a life-long worshiper of The Twilight Zone and Rod Serling's teleplays and short fiction, it was right up my alley. Could it have been beefed up and turned into a full-length novel? Nope. Not this baby. I suspect in order to keep it hard-hitting, Burke made the conscious choice to winnow this one down, omit even the slightest extraneous folderol, and let it stand on its own as what it is: creepy, quick, and concise. Having written that, I should also caution readers not to let the novella-length fool you. At least every 20 pages I caught myself letting out a held breath followed by, "Whew... I didn't see that coming..."
The story is so tight it's difficult to review without spoilers, so I'll stop now. But read this.